No culinary challenge too big with Barbecook's BBQ grill! Charcoal grill, gas grill, electric grill, Firepit-online.com can offer you a varied range of comfortable outdoor grills. Barbecook quality grills guarantee a contemporary design, optimal user comfort and a lot of comfort. These high-quality barbecues also offer you an attractive price. Ordered today before 17.00 hrs, same day shipment for a quick delivery. Bright sun, a nice table, cozy guests, the smell of delicious grilled vegetables, meat or fish: with one of our barbecues or outdoor kitchens is your garden party a guaranteed success. In addition to a successful dinner, our barbecues arefor design, ease of use and durability. Firepit-online.com sells barbecues and outdoor kitchens of all kinds and sizes. Do you want a luxurious outdoor kitchen, or rather an authentic charcoal barbecue? No problem. You will find a carefully assembled range of comfortable barbecues. Are you so fond of the delicious smell of burning charcoal? Then you are probably looking for a traditional charcoal bbq. These barbecues cater for the authentic grilled flavors of meat, fish and vegetables. 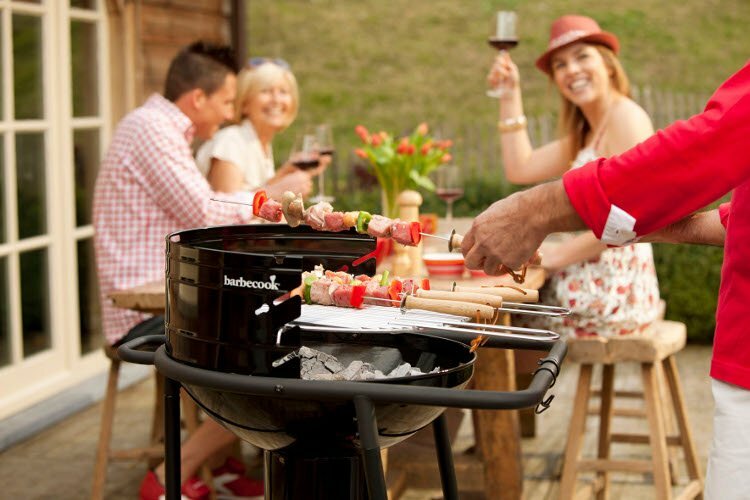 A charcoal barbecue is ideally suited for the true grillmaster, for those who want to enjoy long evenings in the garden while enjoying a cold drink and a delicious grilled piece of meat or fish. Barbecook's charcoal barbecues range is very wide ranging from price conscious entry models to very complete barbecues with hotwood grills and a Quickstop system. Barbecook's charcoal barbecues are all equipped with the convenient Quick Start® lighting system. You have glowing hot cabbages in no time! At Firepit-online.com / Vuurkorfwinkel.nl you can choose from a wide range of different types of outdoor kitchens. These Barbecook outdoor kitchens stand for design, ease of use and durability. The advantage of a gas barbecue is that it is easy and easy to clean. That means extra fun of your investment! The gas barbecue remains a popular product. And that's logical. An outdoor kitchen on gas is ideal for the outdoor cooker who does not want to waste time on heating briquettes or charcoal. A gas barbecue is ready to use in a few minutes so you can start to barbecue! The choice between a charcoal barbecue, an electric barbecue or a gas barbecue is an important decision. Our employees are present every working day to give you professional and expert advice. In addition to comfortable outdoor kitchens we also sell pizza ovens, smokers, terrace heaters and patio fire places: In fact, everything to bring warmth and conviviality into your garden!